There are some days just a pot of beans and cornbread sound good. Rainy days. Chilly days. Spring days. Penny-pinching days. Beans are inexpensive, and they are nutritious. Good for the whole family. Good for babies learning to eat table food. A family can cut grocery expenses and calories easily by eating beans often and growing a vegetable and herb garden. Beans and vegetables combined make a hearty and nutritious meal. The kind of beans my family ate a lot of was green beans. My dad could eat them for every meal. I’m surprised that I still like to eat them. But the kind of beans I refer to when cooking a pot of beans is dried legumes. Dried legumes are also called pulses and have to be soaked in water for 6 to 8 hours. The older they are, the longer it takes for them to cook like it did for my barbecue pinto beans. I used the BBQ beans for other recipes. Since they were older beans, the additional cooking in the other recipes softened them up. Imagine the number of meals you can create with so many different beans. See PattyCakesPantry.com this month for a variety of bean recipes. For instance, have you ever heard of Pecan Pinto Bean Pie? I haven’t until I read about hers, and I can’t wait to try it. How many recipes do you think you could create with this list of dried legumes? Two of my favorite legume recipes include Creamy Tacos (with kidney beans) and lentils with red wine and chicken sausage. So delicious! What are your favorite bean recipes? When I’m in Texas, I like to eat Charro Beans from the H.E.B. supermarket. My daughter got me hooked on them. 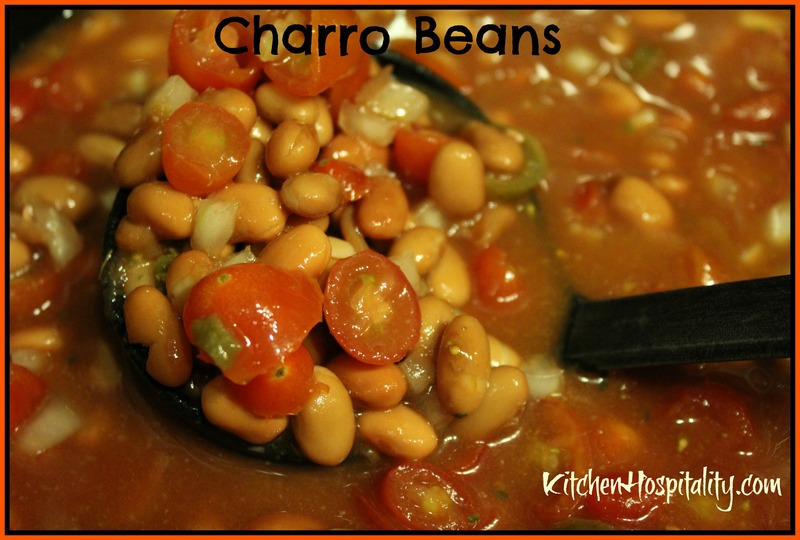 Charro beans are difficult to find at other stores I shop at. So I decided to make my own recipe. It’s like cooking a pot of pinto beans all day then adding all the spices and extra vegetables when they have reached a soft texture. Homemade charro (also called cowboy beans) are better than the store-bought kind, especially when you use your own garden vegetables. Try this charro legume recipe, or adapt it according to the vegetables your family likes. If I have the time, I’ll make the recipe from fresh legumes and cook them all day. 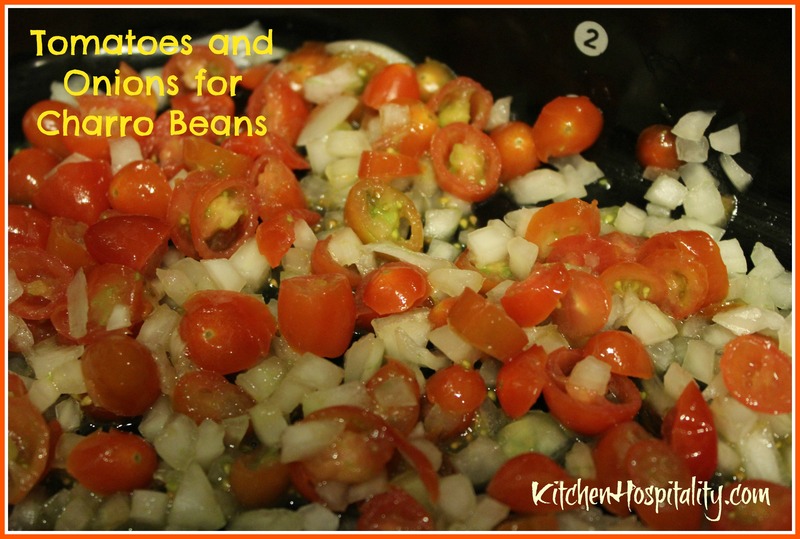 But when I need them done in a shorter time, I’ll use canned pinto beans. The best kind of canned beans to use is the no salt kind. Season them like the recipe indicates or with your favorite seasonings. Grind tomatoes and jalapeno in blender, or slice tomatoes and crush them then slice jalapenos very thin. Add all ingredients in slow cooker and cook on low for 4 hours or high for 2 hours. Option: If fresh beans are preferred, soak them according to directions the night before, then cook 8-10 hours in slow cooker. Add the remainder of the ingredients for at least 30 minutes of cooking. I prefer to let the seasonings cook at least for an hour at the end. Of course, beans that have cooked and have set in the frig overnight always taste better the next day. You’re right about things tasting better the second day. The flavors have more of an opportunity to meld together. I have a friend who makes charro beans. Her recipe is similar except she uses mayocoba beans instead of pintos. She also adds bacon, ham, and hot dogs. It sounds weird, bu it’s delicious.